Is video interviewing an effective candidate screening tool for companies & recruiters? Scheduling multiple interviews at a time is challenging enough. However, All Web Leads dialed up that challenge by hiring 100 employees, month over month, for a call center. The customer acquisition marketing business faced a large number of applicants, and the recruiting team individually screened every single candidate. They relied on traditional in-person interviews and even phone screening for years. However, recruiter Amy Hargrove and her team knew they needed a better, more collaborative solution. By incorporating one-way video interviewing, they’re now more effectively and efficiently screening candidates. As a result, Hargrove has more interview scheduling flexibility, consistency for all applicant processes, and unified collaboration among recruiters and departments. “We were able to take a 45 minute scheduled phone interview and replace it with a 15 minute one-way video interview. This change has saved us countless hours in the screening process, and also has given us the insights to only focus our time on the best applicants,” Hargrove said. Inflexible schedules aren’t just an issue for your hiring team. Candidates hoping for an interview actively search for other jobs while waiting for recruiters’ responses. Unfortunately, these job applicants end up waiting longer than you may realize. 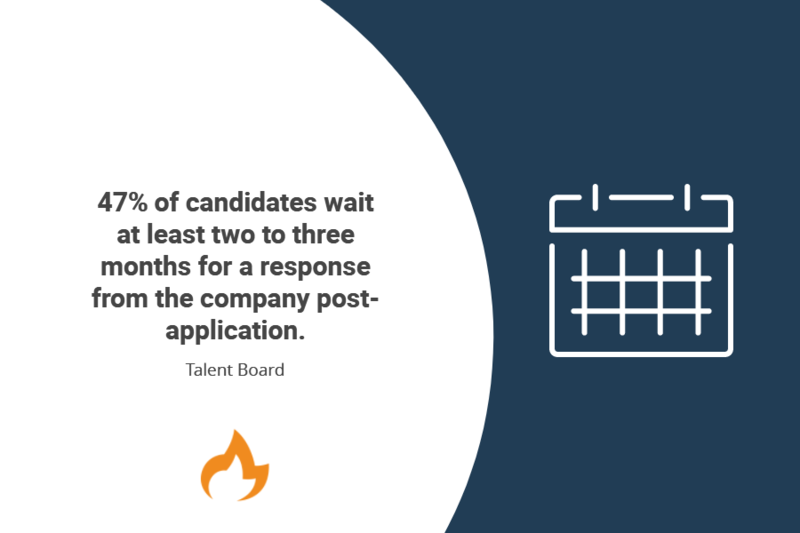 In fact, a recent Talent Board report, the 2016 Talent Board North American Candidate Experience Research Report, found 47 percent of candidates were waiting two to three, or even more, months for a response from the company post-application. This is a continuous area of missed opportunity for organizations and has become a trend over recent years. Long processes and scheduling conflicts cause candidates to lose confidence in your process — and business overall. In fact, nearly four in five candidates (78 percent) say the overall candidate experience they receive is an indicator of how a company values its people, according to CareerBuilder’s 2017 Candidate Experience study. By using one-way video interviews, All Web Leads filtered through qualified candidates who were serious about the job faster. “We are a work-from-home call center that recruits candidates within a 60 mile radius of the office. Each month, I am responsible for hiring about 100 new employees,” said Hargrove. Allow candidates to take charge of their own scheduling process with one-way video interviews. Offering the opportunity to record convenient asynchronous videos improves the candidate experience and appeals to serious top talent. Allow #candidates to take charge of their own #interview process. Also, give your team the freedom to review and provide notes on their own time. This relaxed interview environment will ensure better analysis of candidates. Removing traditional scheduling pressures enhances their ability to effectively measure candidates’ skills, experiences, and cultural fit with a clear mind. But remember to give a strong deadline. Keeping the time frame short will keep the flexibility in place while holding your team accountable. You are very aware of the need for a strong employer brand — for both future and current employees. But maintaining a strong employer brand is impossible without consistency. When your recruiting team uses different screening processes, interview details can be lost or biased. Consistency gives candidates a feeling of organization and professionalism. When your team is on the same page, it resonates outward through your entire brand and creates a positive company image. One-way interviewing ensures consistency. It creates an easy-to-use process in which interview questions can be delivered uniformly. Then, those questions and methods can be reviewed, applied, and revised again and again. One of the payoffs of consistency is increased teamwork. Because one-way interviewing is recorded, your team can collaborate at their own pace and on their own schedule. This is exactly what made one-way interviewing an easy decision for Hargrove and her team. “We love that we have the ability to share our feedback with each other objectively. The team also loves having the ability to alter their interview questions as often they need,” Hargrove said. Remember, consistency isn’t equivalent to inflexibility. Have your team get creative with interview questions to get the most useful answers from applicants. As new hires succeed and move on, adjust questions based on the needs you see evolve for each position. As a recruiter, fighting other companies for top talent is the norm. 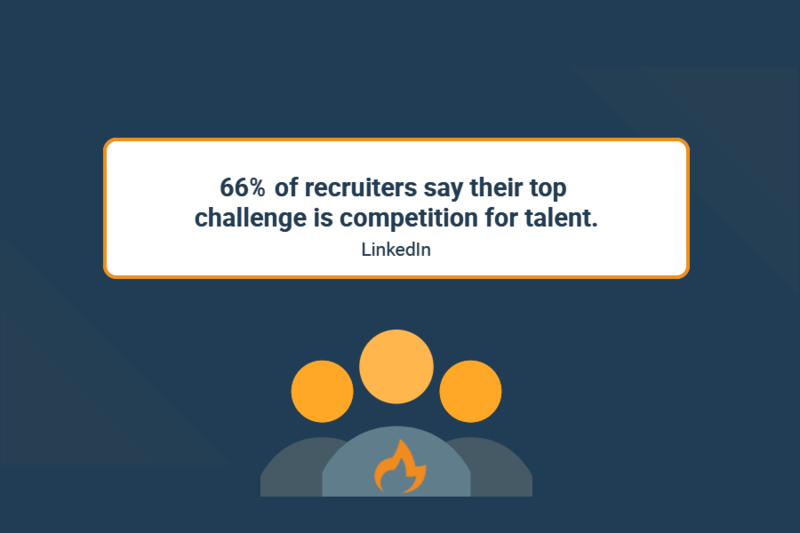 In fact, 66 percent of recruiters say their top challenge is competition for talent, according to LinkedIn’s U.S. and Canada Recruiting Trends 2017. What makes recruiters’ jobs even more crucial and challenging? The LinkedIn report also found 55 percent of recruiters in the U.S. and Canada say they expect their hiring volume to increase over the next year. This means reaching out and increasing applicant submissions is more important than ever. Some employers worry one-way video interviewing takes the sacred personalization out of recruiting. However, it’s important to remember the technological immediacy that candidates have grown accustom to. In today’s world, people want to do things on their own time, from the device they choose, and from any location. Simplifying the early stages of the interview process increases qualified applicant submissions. One-way video interviewing allows recruiters to reach out to candidates beyond their normal talent pools. Traveling issues and scheduling conflicts become obsolete. Once you begin to stream more talent into your application process, you can find more qualified candidates by wasting less time with those who are either unqualified or not fully committed. All Web Leads immediately saw this improvement with one-way video interviewing. Your team is likely used to a set of requirements for finding qualified candidates. As you implement video interviewing, encourage your team to change their mindset and expand their networking reach. It’s also important to make it clear in the job post that candidates will be doing a one-way video interview. This will let everyone know that your hiring process will cater to their varying needs. If you’re still worried about personalization or getting a true glimpse of the applicant’s personality, try switching up a few of the questions. Make sure each one not only fits your culture, but will truly tell your recruiting team something important about the applicant’s cultural fit. Nothing ruins the interview process, for your team and candidates, like confusion. Disorganization elongates the process and makes candidates lose interest in your company. Confusion is a major candidate turn-off during the #hiring process. According to the previously mentioned Talent Board report, candidates who had an overall five-star candidate experience were only waiting for a response after applying 32 percent of the time. Over 45 percent of candidates who were forced to wait said they only had an overall one-star candidate experience. Waiting too long for a response creates confusion about the position’s status, and an immense amount of unnecessary frustration and anxiety. Candidates aren’t the only ones who get confused during a drawn-out hiring process. Inconsistent interview processes and waiting too long for feedback from peers quickly results in chaos among your own team. Adding one-way video interviewing to your hiring solutions reduces confusion by streamlining the process. Train your team on the new technology to ensure everyone completely understands your new form of screening and hiring. Have fun with training and encourage your team to practice one-way video interviewing on each other. Not only will they become acquainted with the technology, but also it’s a great way to build teamwork for hiring collaboration down the road. Communication is key when confronting confusion in the process. It is important to give everyone a hard deadline on when the position will close. Expedite hiring processes by sharing video interviews and feedback immediately. This helps you keep track of where your team stands with each applicant at each step in the review. Of course, unexpected situations arise. In the event there is a delay in the decision process, you can pinpoint the issue and keep everyone on the same page. This allows you to contact applicants if the posted date is expanding to reduce confusion and anxiety. Hiring for retention is every recruiter’s goal. The more collaboration there is when hiring, the better your chances are of finding new hires who will stay for the long haul. 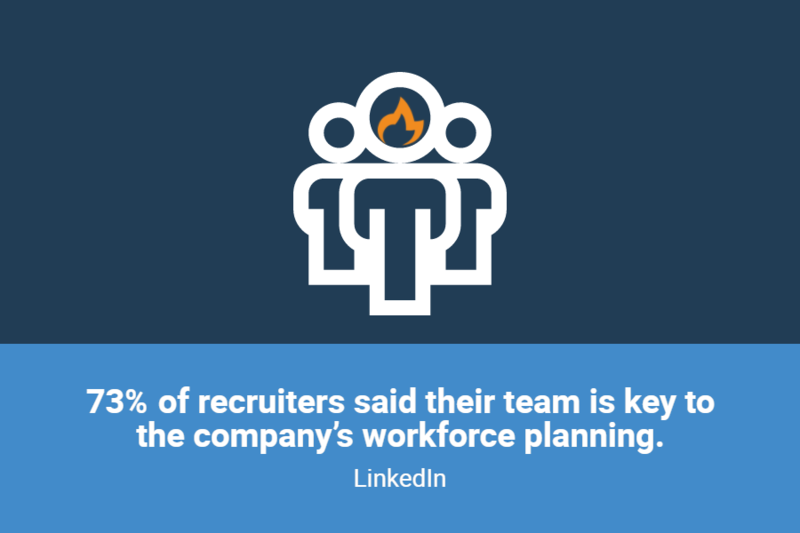 In fact, the previously mentioned LinkedIn report found 73 percent of recruiters said their team is key to the company’s workforce planning. However, with varying schedules, locations, and time restraints, collaboration becomes a major problem. This can quickly lead to contention throughout your team. As a work-from-home call center, All Web Leads was especially in need of an effective collaboration solution. With one-way video interviewing, they were able to share notes directly in the software. Enhance collaboration by encouraging team members to watch videos individually. Then start discussions based on their own conclusions about candidates. After each person offers their input, everyone can go back and rewatch the interview to further assess, if necessary. This added fail-safe guarantees the most informed hiring decisions can be made. Recruiting technology has greatly evolved over the last decade. It’s difficult to make decisions based on what will be most effective for your hiring needs. With one-way video interviewing, your team can alter the process to fit their culture, style, and even busy calendars. One-way video interviewing isn’t just for your team. All candidates are looking for a company that values their time and energy. That means giving them the opportunity to express their initial interests, skills, and experiences on their own time. Why do you think one-way video interviewing is an effective tool? Let us know!